My friends over at Stereogum, (the former no. 1 site for Britney Spears fans), recently busted out a new design and I am reporting on it as if it were hard news. If I had to sum up the new design in one phrase, I’d have to say, “It’s kind of like driving on the wrong side of the road, but in a good way”. 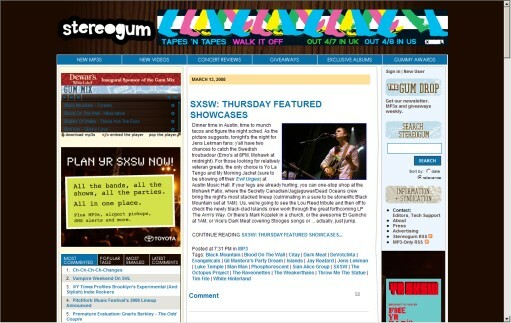 Also, the New York Observer reports that the people behind Stereogum will soon be launching Videogum.com, “a new entertainment blog focusing on television, movies, web shorts, and video games.” Lindsay Robertson (Lindsayism.com) and Gabe Delahaye (236.com) will serve as co-senior editors of Videogum.